The Candy Bar at The Siren Hotel. Photo by Christian Harder. El Moore Lodge. Photo by Marvin Shaouni. Guests enjoying the Trumbull & Porter fire pit. Photo by Nick Hagen. Detroit Foundation Hotel. Photo by Jesse David Green. Detroit’s emerging assortment of curated accommodations with smaller room counts is transcending guest expectations. A crop of new hotels has sprung up across downtown Detroit. And it’s changing the accommodations landscape in The D.
From Midtown to Corktown, from the edge of Grand Circus Park to the shadow of Cobo Center, Detroit’s newest lodging has come in the form of boutique hotels — establishments with fewer than 150 rooms — and, thanks to their smaller size, highly personalized service. Boutique lodging also promises distinctive architecture and a tangible sense of place. Have an overnight experience in one of Detroit’s boutique hotels, and your stay will resemble no place else in the world. That combination made Detroit ripe for development by boutique hotels, said Hodges, some of them now occupying structures designed by masters like Albert Kahn and Daniel Burnham. But he stresses that cool hotels aren’t an end in themselves. They thrive only when Detroit succeeds in enticing visitors to stay. Developments like the QLine, Little Caesars Arena and the expanded Detroit International RiverWalk, among others, have done just that. In Greek mythology, sirens lured sailors with their enchanting music and irresistible singing. It’s an apt symbol for The Siren Hotel, which opened in early 2018 within the former Wurlitzer Music Center, a 14-story building where pianos, organs, jukeboxes, radios and musical instruments were once sold and repaired. After years of sitting empty, The Siren Hotel charms guests from the moment they enter. Travertine floors and an illuminated midcentury “Reception” sign light up a furnished lobby with community tables and the Populace Coffee bar. Pink- and navy-hued rooms range from cozy bunk bed lofts to an upper-story penthouse with knockout views of downtown. All rooms feature terrazzo tiles and hand-loomed blankets adorned with mermaids. The vivid pink Candy Bar with its massive chandelier and disco ball has already become legendary (make a reservation). And true to the building’s original roots, a piano karaoke bar, Sid Gold’s Request Room, opens this fall. The El Moore aims to share its Midtown neighborliness with the travelers who walk through its doors. It’s a practice that happens easily here, where 12 of the building’s 23 units are residential. “We want visitors to feel they are a part of our neighborhood,” said Jason Peet, general manager of the The El Moore. Residents and visitors frequently meet over continental breakfast in the morning, he said, and it’s only natural that residents would share insider secrets. The El Moore’s management relishes this grand old building’s 120-year history. But they have prepared it for the next 120 years. Renovations in 2016 outfitted The El Moore with geothermal heating and cooling, rooftop solar panels and rain capture systems to reduce water usage. And the extensive use of natural light and fresh air ventilation not only keeps visitors feeling refreshed and comfortable but allows them to feel that they’ve done right by the environment. When the Beaux Arts David Whitney Building opened in 1915, jaws dropped. Inside was one of the nation’s most dramatic atriums, a four-story terra cotta and marble lobby capped with an immense skylight. Guest rooms have a clean, contemporary look, with walls and ceilings of neutral hues. Pops of color come from the rooms’ throw pillows, carpeting and desk chairs, brilliant gem tones of red, yellow, royal blue and green that stand out against the taupe walls. The Aloft’s location is tough to beat. The hotel sits on Grand Circus Park with easy access to the Detroit People Mover and QLine. The owners’ move to renovate the Victorian buildings appears brilliant in hindsight as The Inn on Ferry Street enjoys an envied location in the Cultural District. It’s an easy walk to the Detroit Historical Museum and the Detroit Institute of Arts, among other museums. Each meticulously restored room at the inn features lush bedding and period furniture, four-poster beds and the occasional fireplace. Common areas in each “house” recall the elegance of 1890s Detroit: creamy lace curtains, thickly upholstered sofas and richly polished woodwork. In the morning, a hearty hot breakfast awaits. In the 1960s, the Detroit Tigers were red hot, and all of those sports enthusiasts needed a modern hotel. A Holiday Inn was built at the corner of Trumbull Avenue and Porter Street, just two blocks from Tiger Stadium, and came complete with an underground pool. The boutique hotel is instantly recognizable by the Don Kilpatrick mural painted above the building’s porte cochere. Inside, Trumbull & Porter’s polished concrete floors and crisp white decor are brightened with Detroit-made artwork and linens. In the lobby, you’ll find local Crazy Fresh Coffee and Batch beer in a lounge adorned with Burroughs adding machines, a Detroit original. Detroit Foundation Hotel’s guest rooms recall the city’s industrial heritage. Richly finished headboards of reclaimed wood are brightened with swaths of faux Fordite. In-room coffee makers are replaced by automotive fuses, which you trade in for free coffee in The Apparatus Room. And channel-tufted guest room sofas in turquoise and chocolate brown are reminiscent of Detroit’s automotive heyday. Detroit Foundation Hotel lies within an easy walk of downtown’s major attractions. But you might check out a pair of wheels instead. The hotel offers complimentary use of its stash of Detroit Bikes. Metro Detroit has a long list of long-established boutique hotels with award-winning reputations. Royal Park Hotel in Rochester is a luxurious English manor house on Paint Creek. The Townsend Hotel in Birmingham offers 150 luxurious guest rooms and the award-winning Rugby Grille on-site. 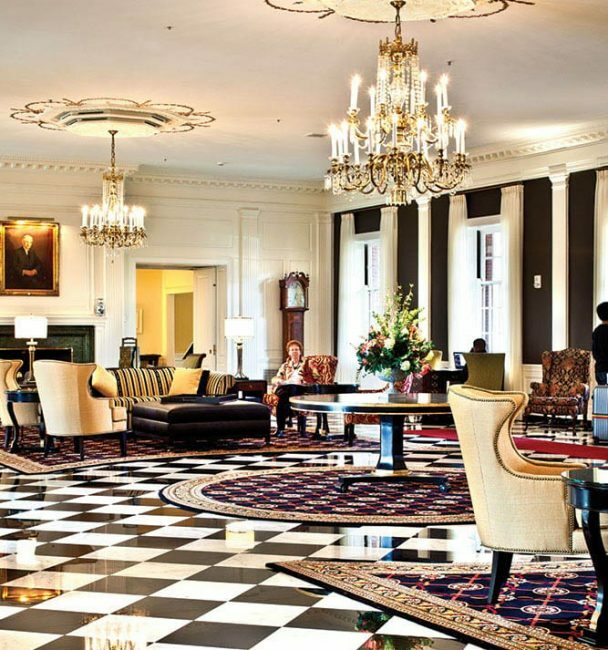 The Inn at St. John’s in Plymouth is a 1940s seminary redesigned as a luxury hotel with 118 rooms and conference center. Has a 27-hole golf course, too. The Dearborn Inn. Photo by Jason Vaughn. The Dearborn Inn – A Marriott Hotel in Dearborn was built in 1931 by Ford Motor Co. This nationally registered historic place is super close to The Henry Ford historical attraction. The Henry, Autograph Collection in Dearborn is a posh hotel celebrated for its vast contemporary art collection. 234 Winder Street Inn is a B&B sitting within walking distance of all three of Detroit’s professional sports arenas. The restored 1870 Emanuel Schloss house has five guest rooms. Detroit’s hotel boom isn’t over yet. Here’s our short list of additional new-and-upcoming hotels. The high-end watchmaker makes its much-anticipated debut, joining five buildings into one 130-room hotel. Expect historic architecture, modern amenities and rooftop gardens. Once home to Detroit’s jewelers and watchmakers, the Metropolitan Building is reinventing itself as a 110-room Starwood hotel with extended-stay options and a green philosophy. Opens mid-2019. Built in 1920 by architectural mastermind Albert Kahn, the former Standard Accident Insurance Building is undergoing a $65 million renovation to house 70 apartments and a 100-room boutique hotel. Promising to rely on Detroit-based artists and locally sourced restaurant ingredients, West Elm will base its new 135-room hotel in the city’s Brush Park. The existing Crowne Plaza hotel has announced the addition of a 28-story tower and 498 new guest rooms adjacent to Cobo Center. At least one hotel is slated under the continued development of The District Detroit, most likely at the corner of Woodward Avenue and Henry Street, according to Olympia Development. Timing and other details are still under wraps.